Miss M wanted a Garden Themed Birthday Party this year.... and for some strange reason, I decided to make all the decorations out of coffee filters and paper plates. Seriously, don't ask me why. I suppose I needed a challenge. Maybe I was bored. I have no idea. 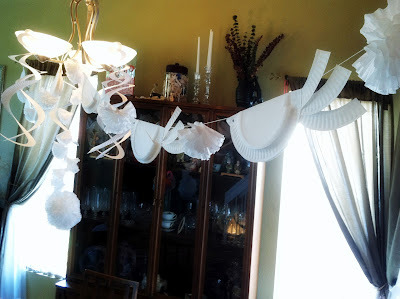 But in the end, I spent a day or so playing with paper plates and coffee filters - and, come to think of it, cupcake liners as well - finally settling on a few designs ﻿that I could use to make bunting, decorations and treat bags. 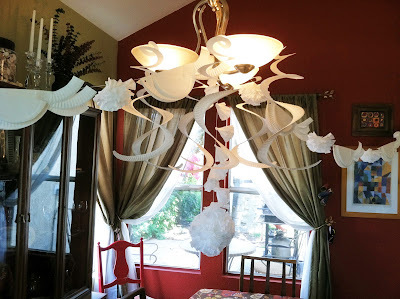 I ended up with Paper Plate Birdie Bunting, Coffee Filter Flowers, Paper Plate Spirals and a Giant Coffee Filter Flower/Disco Ball Hanging Centerpiece. I think it cost me $2 at the Dollar Store. We also had several crafts for the five-year-old girls who came to the party: Paper Plate Hats with Coffee Filter Flowers that the girls decorated, and Coffee Filter Butterflies. -aaaand... A half empty cup of coffee if you want to get all technical about it. 1. Paper Plates. Two of 'em. 2. 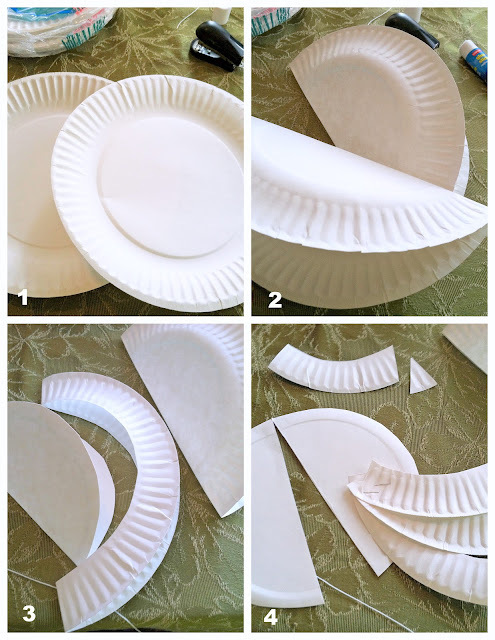 Fold BOTH plates in half. One plate will become the TAIL, BEAK & WINGS. The other Plate will become the BODY. Set the Body aside for now. 3. 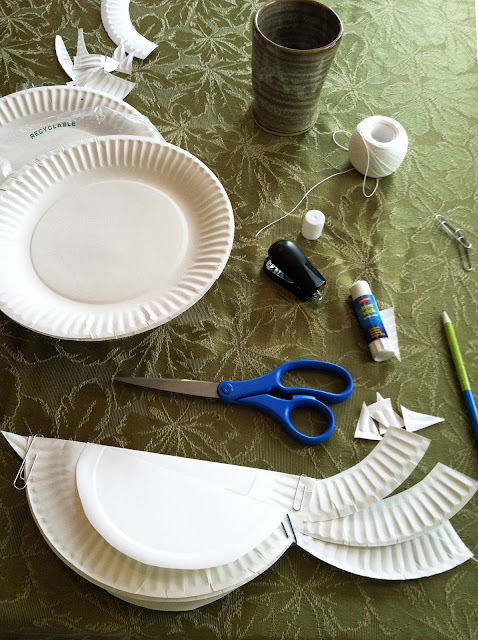 TAIL: Cut the Rim off of ONE plate. 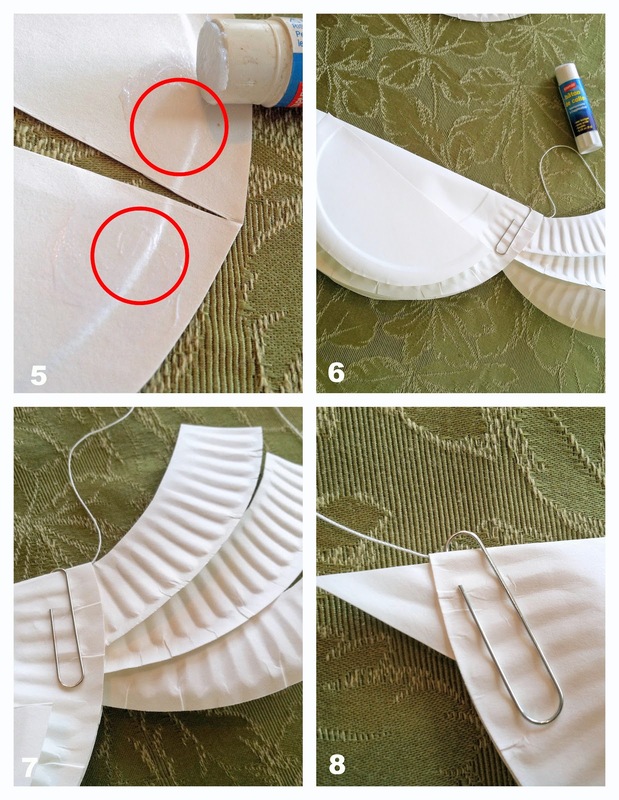 Fold the cut-off rim into fourths and cut into four pieces. 4. Staple three of the rim pieces together to form the tail. BEAK: Cut a triangular beak out of the extra piece of rim. WINGS Working with the left-over (middle) portion of the cut plate, cut along the fold ALMOST to the edge. I left about a millimeter or so, just to keep it together. 5. Apply glue to the wings as shown (in red). 6. Attach the WINGS to the BODY (the second, un-cut plate) close to where you want the head to be. I attach the wings so that the edge hits just between the ridge and the flat portion of the body plate... I realize that got cut off a bit in the picture... see the completed bird (below) for a better view. Let the tips of the wings droop down a little as you glue on the wings. IF STRINGING FOR BUNTING: Now is the time to slide the string into the folded plate. 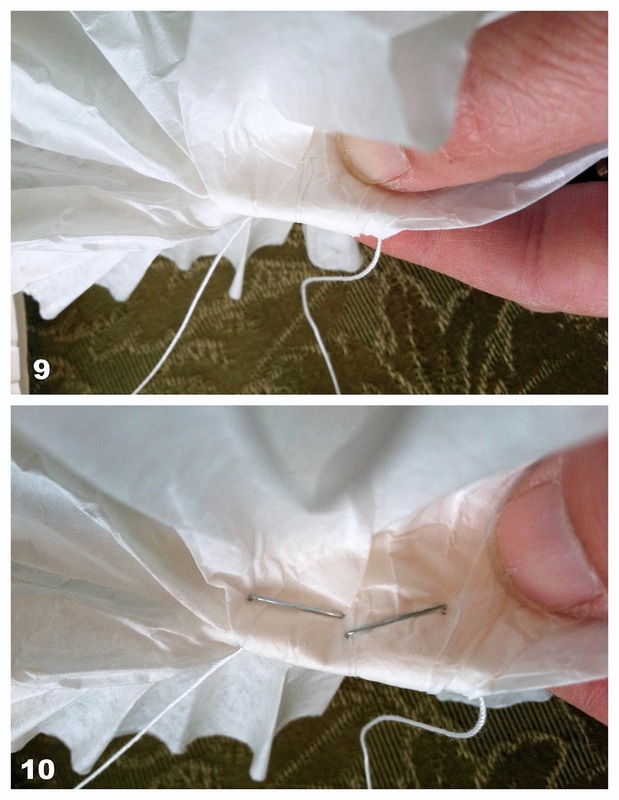 Be careful when gluing the beak and the tail in steps 7 & 8 that the string slides freely through the body. 7. Apply glue to front and back of tail near the staples. Glue the TAIL to the inside of the folded BODY, opposite to the end where you've attached the wings. Hold the join with a clothespin or paper clip until the glue dries. 8. Apply glue to both sides of the the beak (the non-pointy end). Glue the BEAK to the inside of the body plate. Hold with a clothespin or paper clip until the glue dries. 1. Lay out four or five filters as shown. 2. Make an "OK" sign with your non-dominant hand (a circle with your thumb and forefinger). 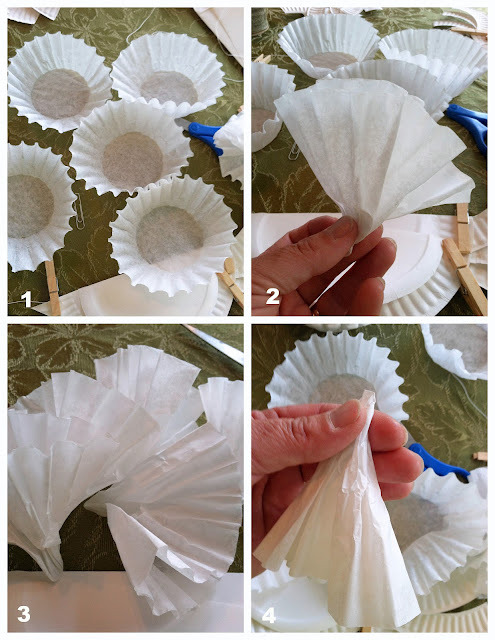 With your other hand, pinch one filter in the middle of the flat, circular part, and pull it through your "OK" sign, crumpling the filter into what will be the petals. 3. Repeat with all four or five filters. 8. ... until you have formed a flower. Don't make these too neat... the beauty here is in the asymmetry. 9. 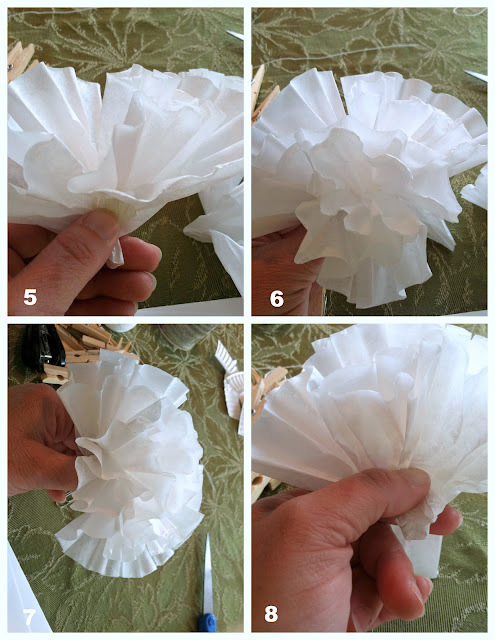 Holding all of the petals together, fold the points over the bunting string. 10. Staple the flower to the bunting string, being careful to allow the string to move freely. Try not to staple the flower directly to the string, or it will be more difficult to adjust later. 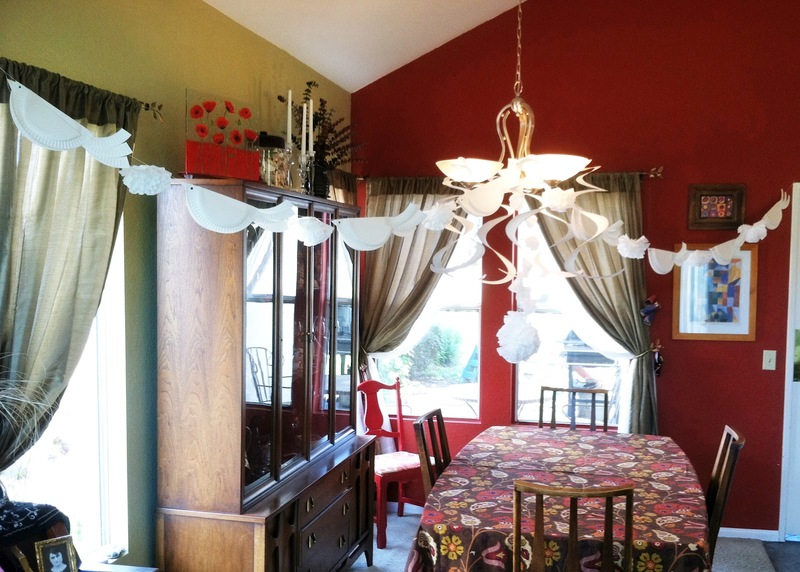 Alternate Birds and Flowers on a long string for Crazy Cheap (and really pretty) Party Bunting! hanging coffee filter disco-ball effect!